The following projects have gotten me to try something new for me: taking notes. 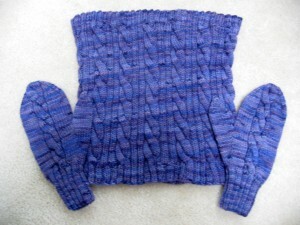 You see, usually, I just go by memory and examining the first item I knit of a pair to knit the second one of the set. That doesn’t seem to be working for me anymore. These are Seed Vessels cowl and mittens from The Country Diary Book of Knitting, knit in Spirit Trail Fiberworks’ Brigantia that I got as part of Jennifer’s club. Actually, it is more accurate to say the cowl and mittens are based on, rather than actually are, as the cowl in the book is over 20 inches long, and I couldn’t imagine someone wanting 20 inches of knit fabric under her chin, so I kept it to 12 inches. That, and the mitten pattern is knit flat and sewn together to make very small mittens that would not fit an adult. This is where the problems came in. I used Ann Budd’s The Knitter’s Handy Book of Patterns as the basis for the mittens, adding the cable pattern to match seed vessels. I played around with the cap of the mitten, and got the result you see above. When it came time to make the second mitten, I could not get the count right for where to start the cap so that the mittens would match up with the cable pattern. I knitted, ripped, knitted, ripped, and knitted again. I finally got it right, but if I had written things down as I went, I could have saved myself some trouble. 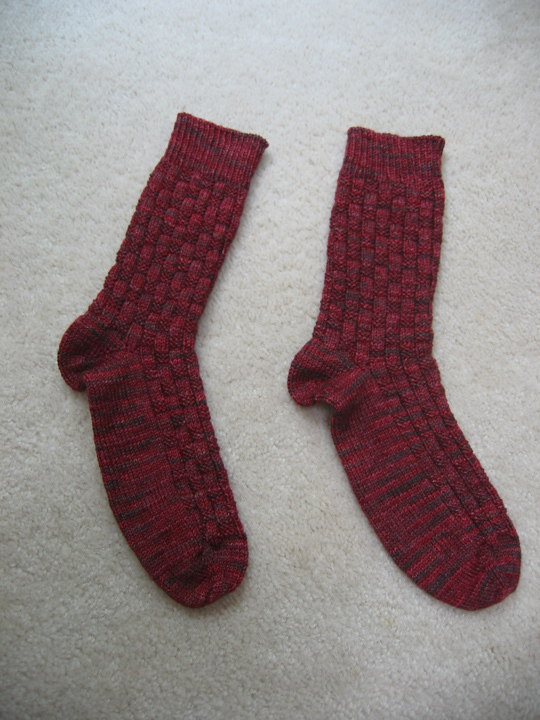 These are the basketweave socks in Sheila’s Hounddog colorway. 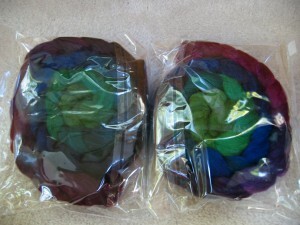 (On a side note, Sheila is closing the doors to the dye shop, so if you want a particular colorway, you better hurry.) I did the first sock, but didn’t get around to the second sock for a month or so. Figuring out which row I stopped on to start doing the heel was annoying. Again, if I had just made a few notes, I would have saved myself some aggravation. I picked up some journals with grid paper that I can take notes in for my projects. 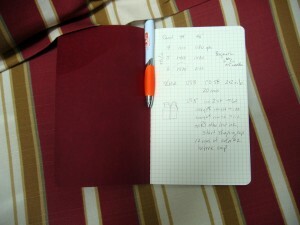 I have a journal for knitting, for weaving, for spinning, and for dyeing. And I have started using the knitting journal. This is the Brigantia that I picked up at MDSW. Pretty sweet, huh? BTW, in totally unrelated news, Mr. Penney and I are now officially married! Woot! Another Maryland Sheep and Wool Festival has come and gone. This year, the weather could not have been more perfect. It was just cool enough for those that wanted to wear the sweaters and shawls that they had knit could do so without dying from heatstroke, and it was sunny the entire weekend. People thought I was a little underdressed (I was in t-shirt and shorts), but I work in a freezer-like environment, so my personal thermostat is a bit off at this point. While I still got plenty of fiber this year, it is nowhere near the amount that I have purchased in past years. This is mainly due to not having gotten to working with what I have purchased in past years, and I didn’t see a point in just adding to the queue if I didn’t already have a project in mind for it, or if I already had something extremely similar waiting for me at home. 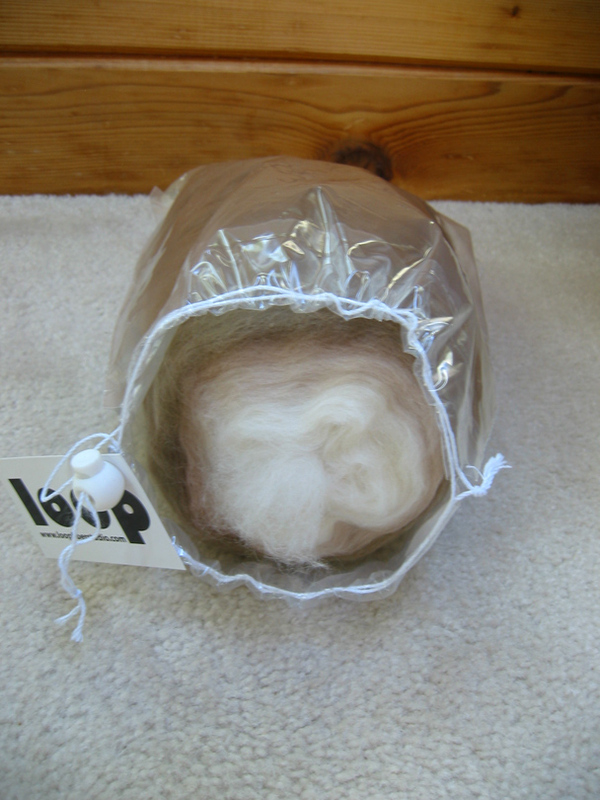 So I did not get a fleece this year, nor did I get any large bumps of Romney and mohair. That is not to say that I came home empty handed. On Saturday, my first purchases was at Kimber’s Fiber Optic booth. She has started applying her gradients to yarn as Paintbox Gradients, and she had those that she has already released at the booth. I picked up Bitter Lime to Rose and Copper to Verdigris on Kashmir sock yarn. 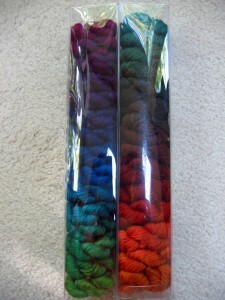 Each little skein is 30 yards, for a total of 450 yards for each colorway. I then stopped by Jennifer’s Spirit Trail Fiberworks booth for yarn to make a cardigan. As I already mentioned, I work in a freezer-like environment, so I have decided that I am going to make myself a cardigan to wear at work. 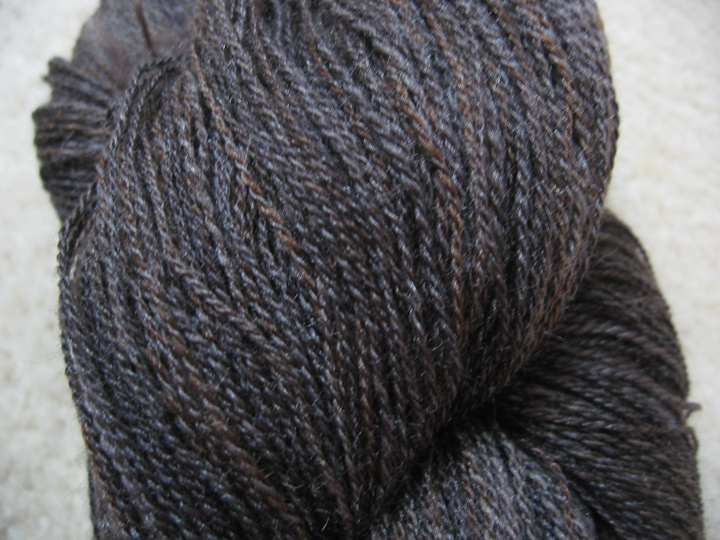 This yarn is Brigantia, a DK weight that is 85% Polwarth wool and 15% silk. 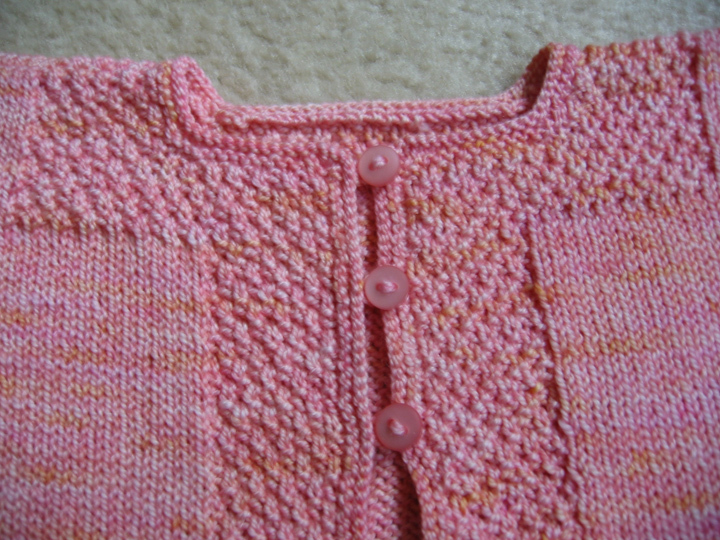 The skeins are arranged as shown because I am planning on a stripe across the chest. I am going to be using one of Ann Budd’s Knitter’s Book of Handy… patterns for the cardigan, though I have not entirely decided which one. On Sunday, I went back to Fiber Optic to pick up Bitter Lime to Rose in the merino/silk to spin. For some reason, I always miss this on the pre-orders, so I picked it up at the festival, since it has all of my favorite colors in one place! I also picked up a bullseye bump from Loop. The colorway is Sand Dollar, and the fiber is merino, tussah silk, and bamboo. I have seen these around for awhile and always wanted to try one. I currently have it on the wheel, and will give you a report on it later. Finally, on Sunday, I picked up my entries. 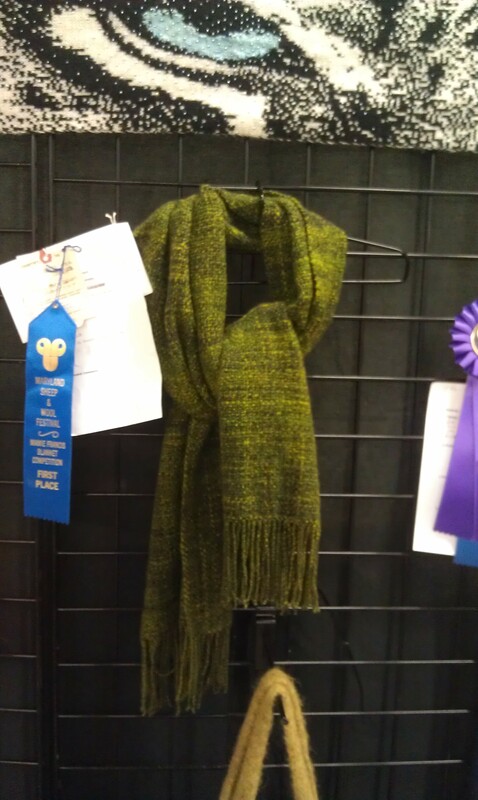 The shawl got a first place, though it was moved from shawl to scarf, which is fine by me. And my blanket, that has been a poorly kept secret, also got a first in its category: blankets made with at least 50% wool. I will tell you more about this next time. I was starting to put this entry together and was thinking about what I was going to say about the final product, when I realized that I have really gotten behind on showing things here and never showed the yarn that I used for it. 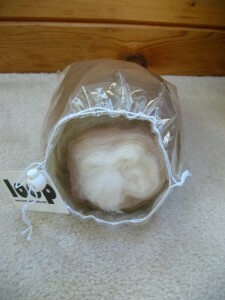 This is yarn that I spun a little over a year ago from two different colorways of BFL from Dragonfly Fibers. I got them when Kate had a trunk show at Cloverhill. 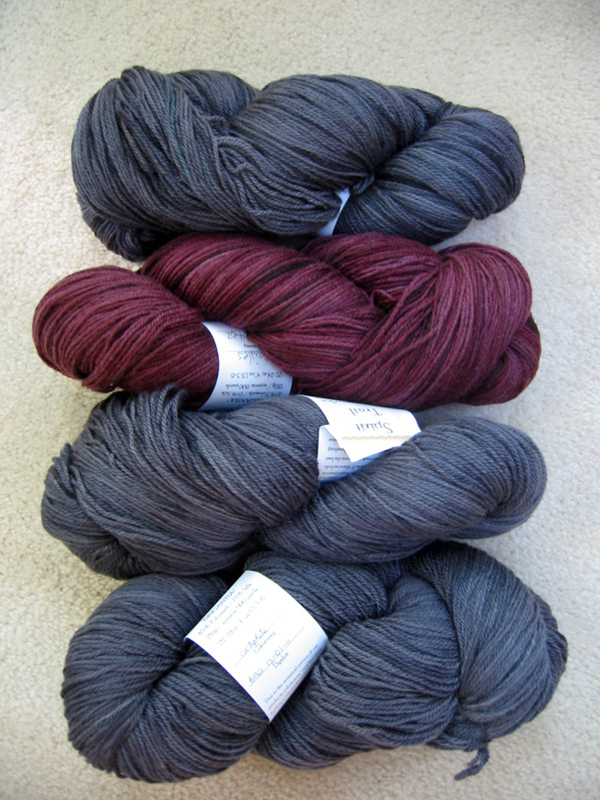 The colorways are Cherry on Top and Ode to Sock Summit. I spun up each colorway and plied the two together. I figured that there was enough common between the two colorways that it would all work out. 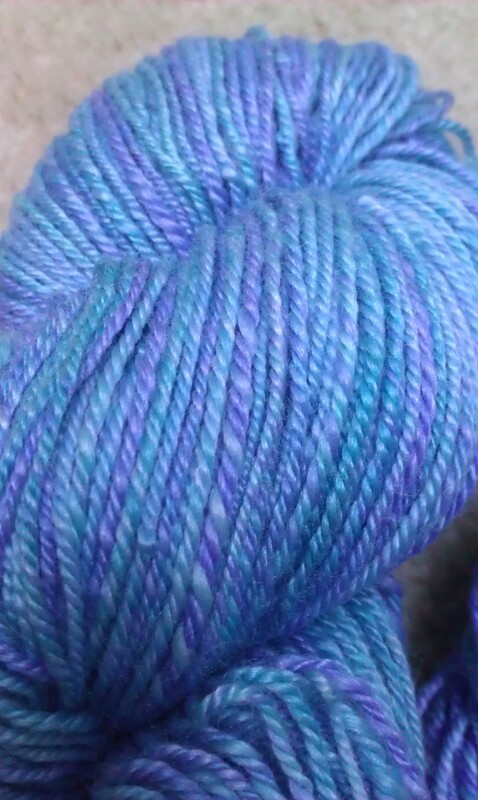 I originally spun this yarn to make something for someone else. But we always think we have more time for things than we actually have, and I only got as far as the yarn. Lately, I have been on a kick to use my handspun, so, with a year passing, I figured it was time to make something with this yarn to see how it all work together. 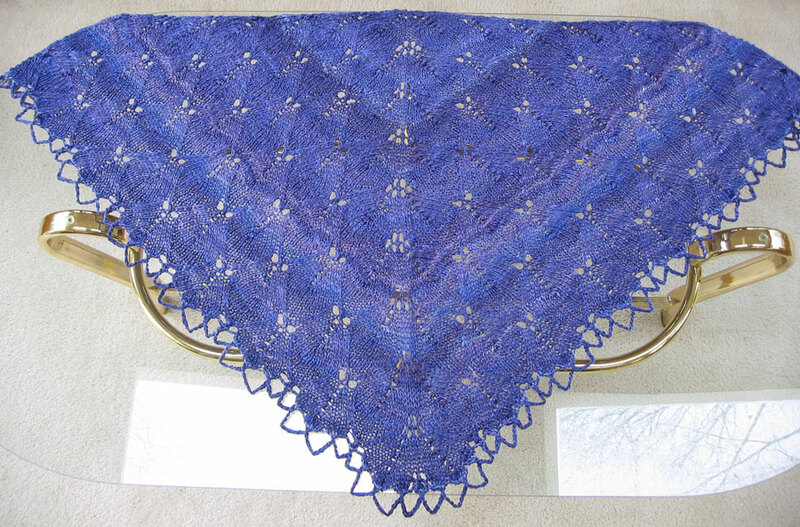 I decided to make a small, simple shawl, which is what I had originally planned because with all of the color going on in the yarn, any kind of fancy stitch pattern or tricky design would fight with the yarn. I really like how it all came out. The colors worked out well together. 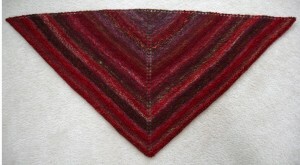 While working this shawl, I really enjoyed seeing the color combinations go by. 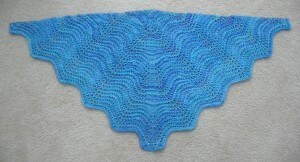 I gave this shawl to a friend of mine that just finished up her chemo treatments. She was surprised to say the least, and very thankful. Copyright 2013 by G. P. Donohue for textillian.com. You may remember this handspun from a while ago. With that in mind, I went looking for a shawl or shawlette pattern that work with the yarn. I found the Sally Rand pattern on Twist Collective. 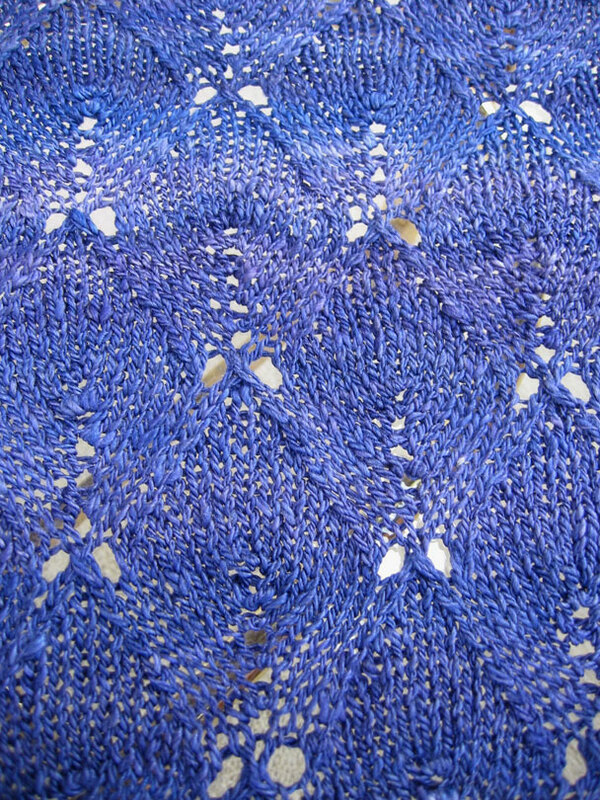 Feather and fan is one of my favorite patterns for variegated yarn because curves made by the stitch pattern gives such movement to the colors. It all made me think waves crashing on the beach. I thought it would make a good birthday gift for my sister. I didn’t do the full shawl because I didn’t have enough yarn for that, but it should be good as a shawlette. 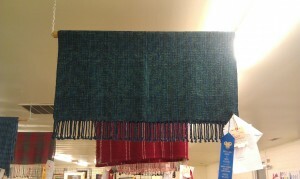 The bamboo in the yarn gives it a nice drape. I am pretty happy with how it came out. Back around Thanksgiving, Mr. Penney was talking to his mother. At this time, she hinted that it would be really nice if I could knit her a cowl like she saw at J.C.Penney. I went and took a look at the cowls that J.C.Penney was selling, and decided that I did not like any of them, so I was devise one of my own. And here it is! 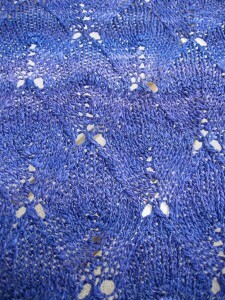 The yarn I used is Dragonfly Fibers’ Djinni Sock in Wood Hyacinth – B side single. (B side single meaning that it is not the regular for the colorway). The cowl itself only took about a half of a skein. 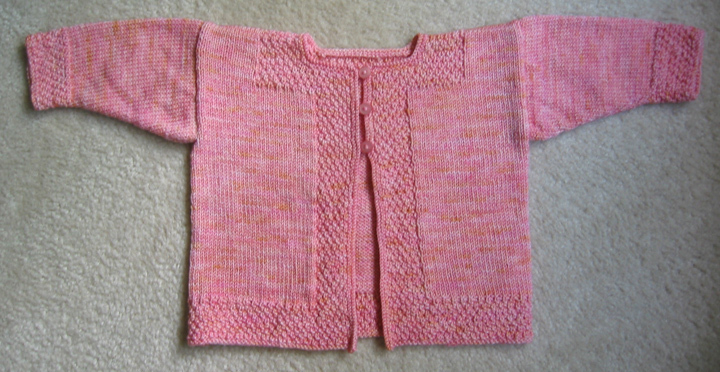 The main stitch pattern is Japanese Feather from A Second Treasury of Knitting Patterns by Barbara G. Walker. 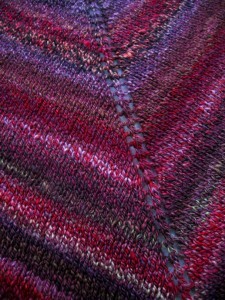 The top and bottom of the cowl is just seed stitch. 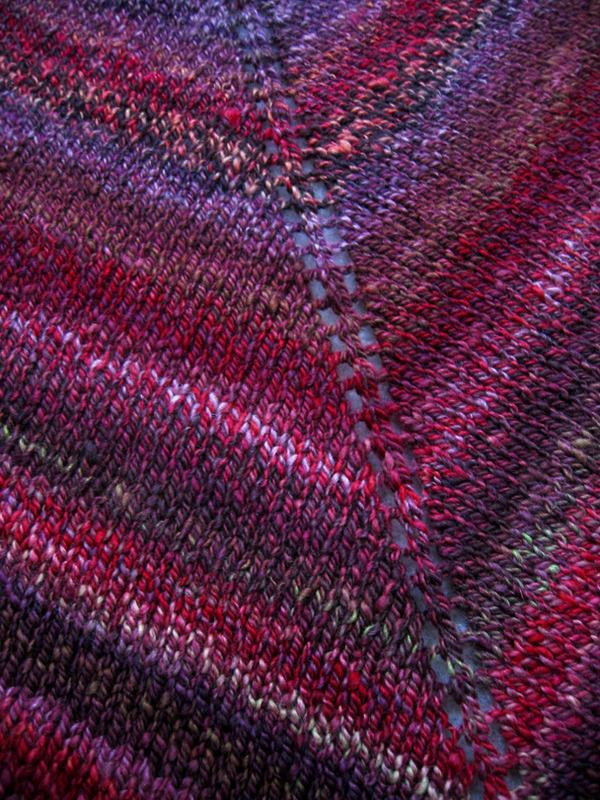 Since the Japanese Feather pattern is an odd number of stitches to the repeat, I did an odd number of repeats so that there would be an odd number of stitches for the cowl overall, and thus, the seed stitch could be worked as a continuous k1, p1, with no break between rounds. Once I was done knitting, I blocked the hell out of it. I am pretty happy with the way that it came out, and my mother-in-law got it for Christmas and loved it. I don’t think anyone ever doubted that I would make her something. Because, well, really, must I explain? 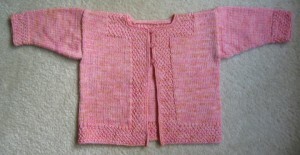 The pattern for this matinee jacket is from a Hayfield pattern book from years ago. I am pretty sure that the pattern book is not available new anymore. 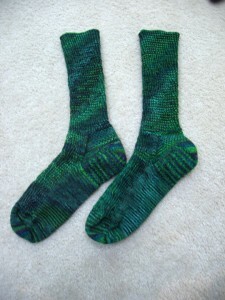 The yarn is Kate’s Dragonfly Fibers Dragon Sock in the Conch Shell colorway. It knit up pretty quickly. Of course, when I order something that is pink (or any light color), people that I normally purchase fiber from know that something is up. Go ahead, look back at my projects. I’ll wait. See, I normally pick darker colors. So, yeah, when you see me making something in a color like pink you know it’s not something I am making for myself. Yes, it’s about that time. Well, I didn’t post for the whole month of July. Wish that I had a good excuse for that, but I don’t. True, there are things that I am working on that I can’t show to the world just yet, (and to those of you who know what they are: Hush! Don’t spoil the surprise.) but I still have plenty that I can share with you. I have been busy with spinning. Kimber had a spin-along on Ravelry to get through your stash. I finished my spinning for that a month after the spin-along was over. Oh well. The fiber is her merino/silk pencil roving in the Black Coffee colorway. 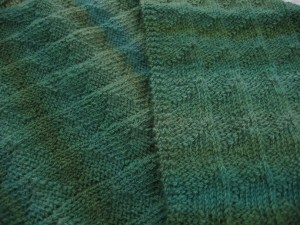 If you’ll notice, one of the skeins looks a little “funkier” than the others. 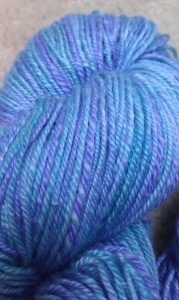 That is the skein I tried to ply before MDSW. 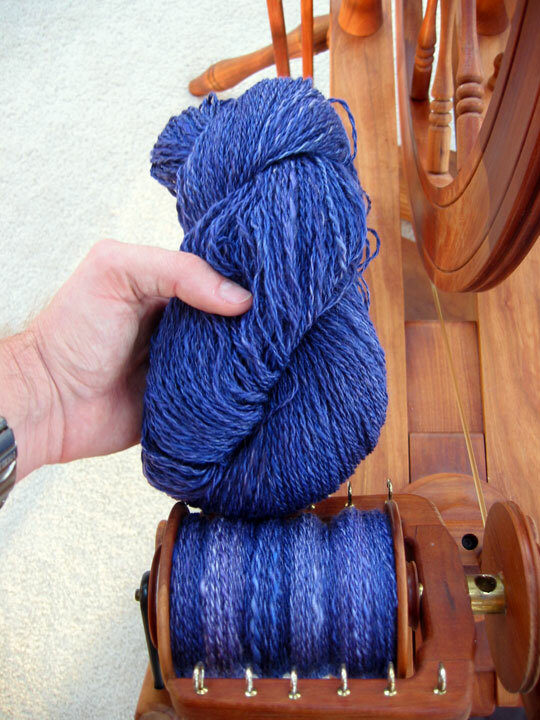 But in my haste, I plied the entire thing IN THE WRONG FREAKIN’ DIRECTION! Yeah, that’s not good. So I had to undo that and ply it in the correct direction. Fortunately, that only happened with the one skein. 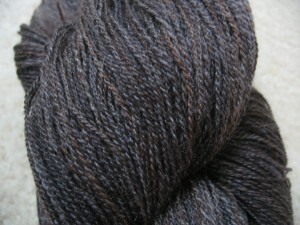 Here is what the big, good skein looks like close-up. I figure I will weave a scarf with it, in time. I was surprised at how thin I managed to spin it, so I got good yardage. 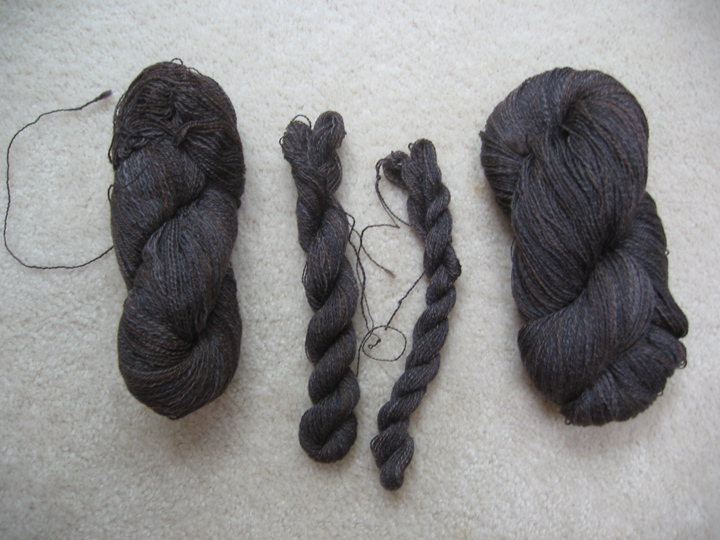 That big skein that I did right is over 600 yards, alone. At MDSW, I got a couple things from Kimber that I am working. 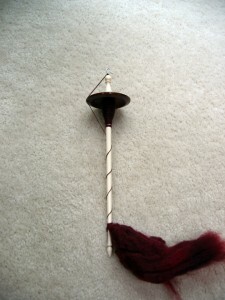 One is a drop spindle. This occasionally happens to me. I see the pretty woods of all of the drop spindles and think, “Why don’t I drop spindle that often? It is so portable and those spindles are so beautiful.” Well, I will tell you why I don’t drop spindle that often. I am painfully slow at it. The fiber that I am spinning here is Kimber’s merino/silk/yak roving in Jolly Old Elf colorway that I got last Christmas. I am not sure how much longer this project will stay on the spindle. Fortunately, no one is waiting on it, unlike this one. I recently finished Navajo plying that yarn for Mr. Penney’s scarf, and this knitting that you see is my trying to find the right needle size for knitting the scarf. The fiber is from Spirit Trail Fiberworks fiber club from last year. 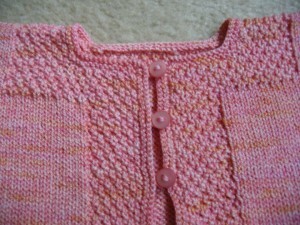 It is 80% merino and 20% cashmere, so it is plenty soft and is great for a next-to-the-skin garment like this. Hopefully, I will have it finished before winter comes so that he can use it! Finally, it is getting to be that time again. I just finished plying this fiber that I got this year at MDSW from Kimber. 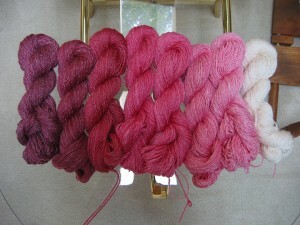 It is superwash merino and bamboo in her Raspberry to Cream gradient colorway. 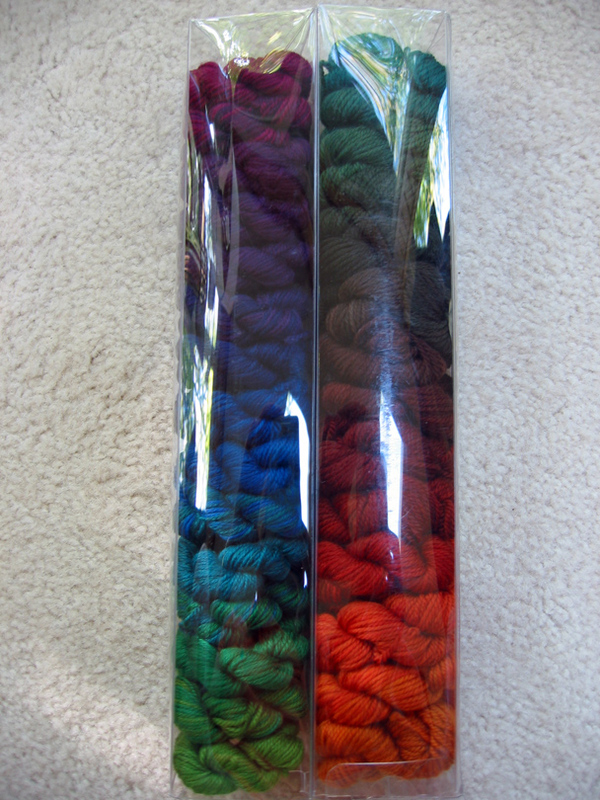 I separated the colors in the colorway so that I have distinct yarns to weave a shawl with. 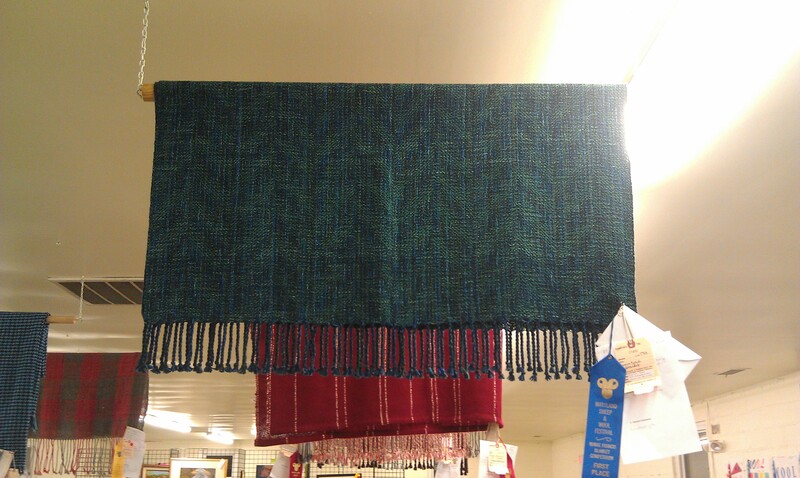 Now to figure out the weave and color order for the shawl. Copyright 2012 by G. P. Donohue for textillian.com. It has been awhile since I have posted about socks, hasn’t it? Actually, it has been awhile since I have posted, period. 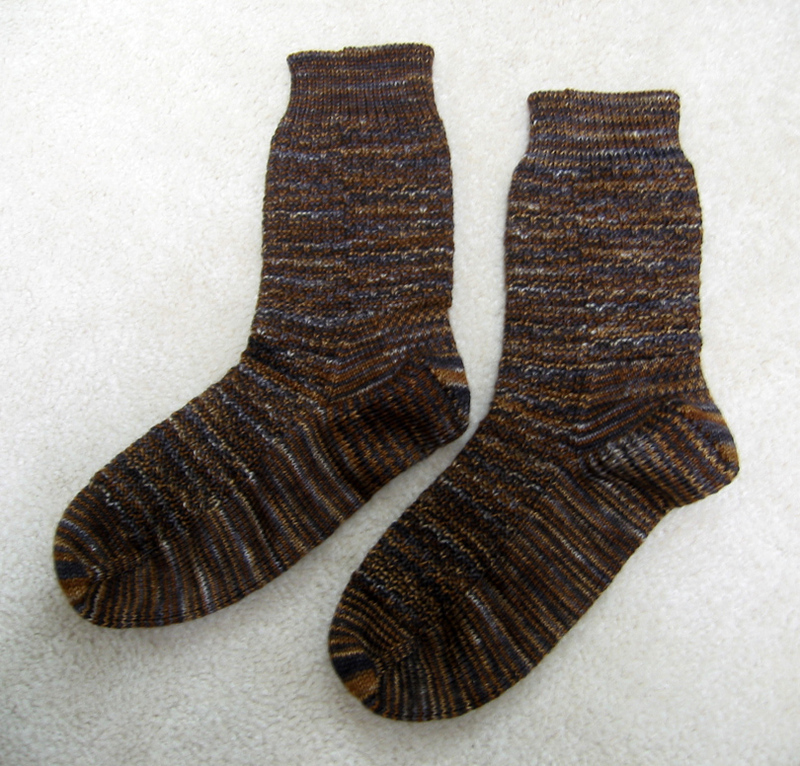 In any case, finally I have a post about socks. Not just one pair, but two! Both pairs are patterns that I have done before, for the most part. 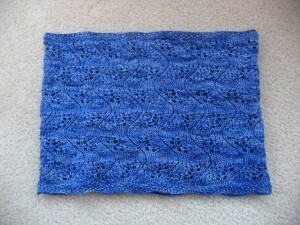 I previously did this pattern using Dragonfly Fibers’ Djinni in the Bad Moon Rising colorway. 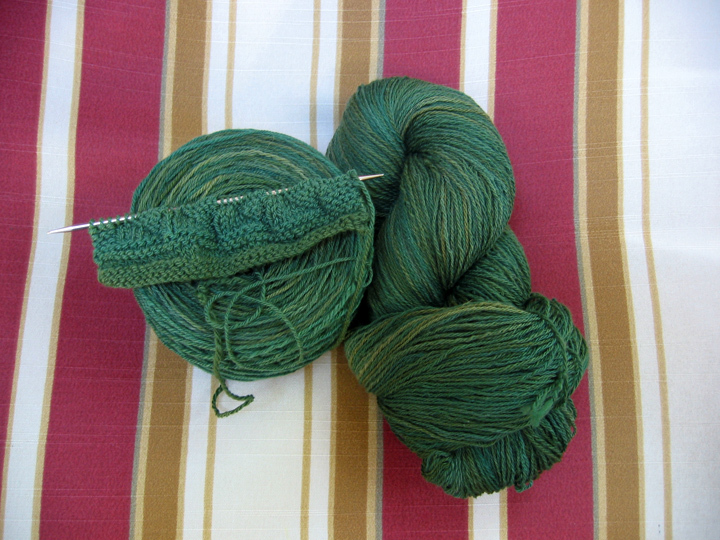 This time it is the same base yarn, but in the Tortuga colorway. While doing all of the knit through the backs of stitches and all of the cables takes a bit of time, this sock pattern does something for me that no other sock does: Has a will of its own to stay put on my leg! Other socks seem to work their way down to my ankle after doing such things as crossing and uncrossing my legs, but this socks stay put; and I respect them for that. Another reason for doing this pattern again is that I plan to write up the pattern. I had planned to have that done already, but plenty of other things have come up that have gotten in the way of that. And this pattern is an old standard for me. 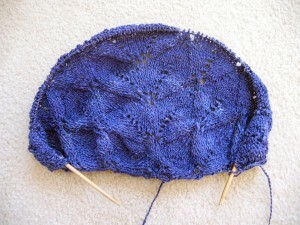 It is one of my go-to patterns when I just want to knit something. It is from Schurch’s SKS book. 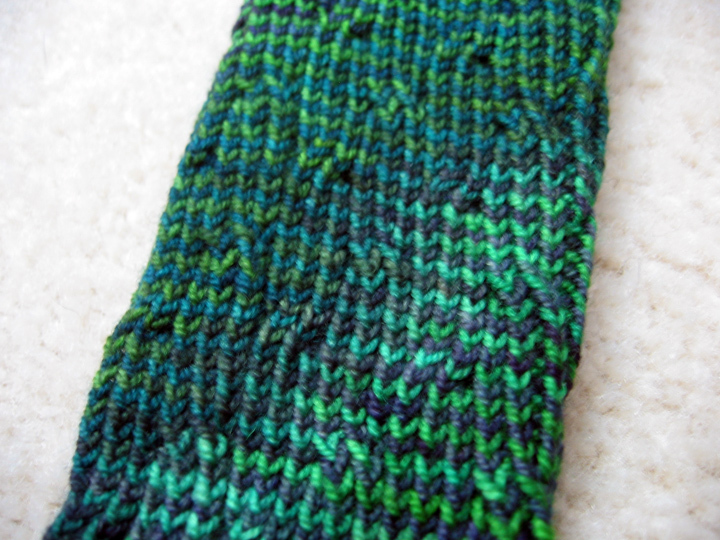 The heel, though, is from her new book, The Sock Knitter’s Handbook: Expert Advice, Tips, and Tricks. 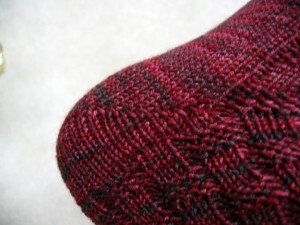 The heel is the no-wrap short row. 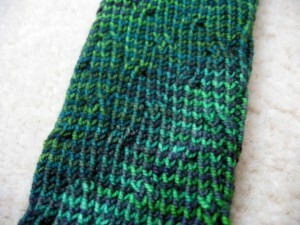 While I like the actual results of the heel, I think that there may be an error in the instructions for it in the book. 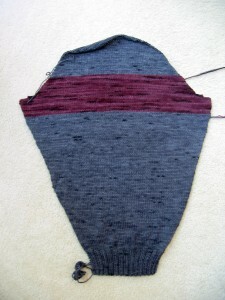 It seems that the count is off when going back to do the second half of the heel. Has anyone else tried the heel and found the same thing, or is it just me? I wound up changing things around to get things to work out the way that I thought that they were supposed to. Now I have to figure out what sock I want to knit next. Not a bad position to be in! It is not often that I see something that someone else has made and want to make it, but when I saw Roseann’s Azalea Center Piece, I knew I wanted to knit the pattern myself. I immediately purchased the book the pattern was in, The First Book of Modern Lace Knitting, as well as The Second Book of Modern Lace Knitting. 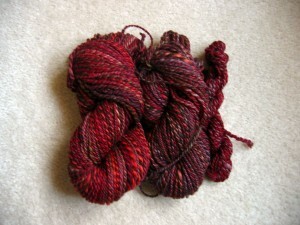 Several years later, I spun this yarn from Kate’s Dragonfly Fibers Sea Monster roving. 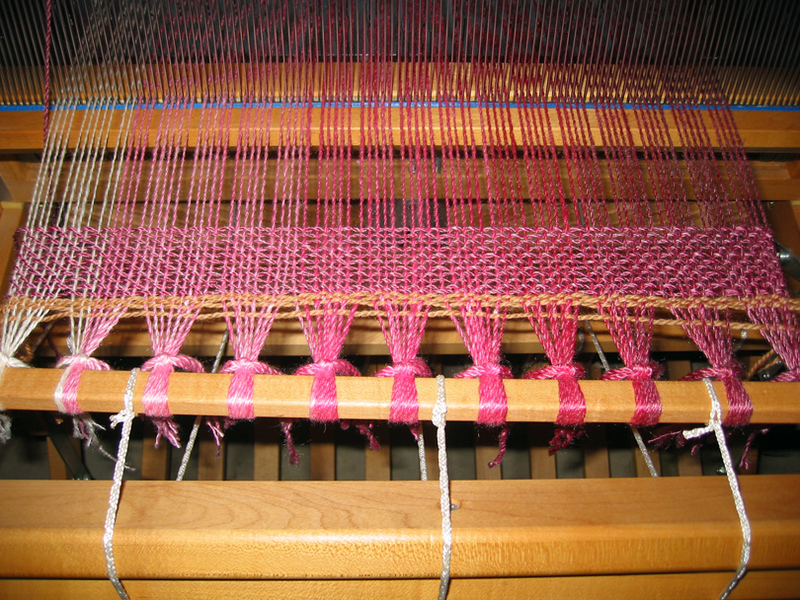 It was an incredibly fun spin; and at the time, I thought I was going to use it for weaving. 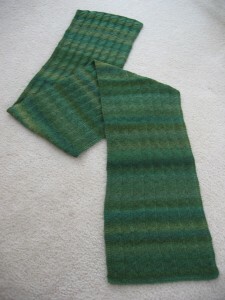 As time went by though, I thought the yarn might be too thick to weave a scarf of the proportions that I would want. It occurred to me that this might be the yarn to knit the Azalea in. Originally, I thought I was going to three sections of the pattern as a shawl, but after trying out that way, I saw why others on Ravelry only had only knit two sections of the pattern as a shawl. So, rip out and start again. It was a quick fun knit, though I will not use these bamboo needles again for something like lace again. The joins between the wire and the needle is not smooth, and the yarn did not slide over the join well, causing some of the stitches to “skip” over each other, causing me to be watchful of how the stitches were situated before knitting them. With the knitting done, I blocked it. I gave it to my mother for her 80th birthday. Kate just had an open studio yesterday. It was a fun event, and as you may have guessed, I got more Sea Monster! 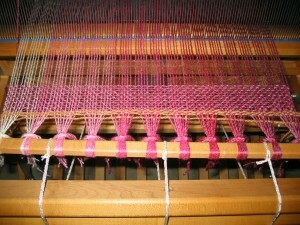 The Weavers Guild of Greater Baltimore, Inc.